An architect in Boulder has come up with a fresh new plan to take care of the city’s homeless population. He wants to erect tents and tiny houses in a new park, an eco village where the wanderers can find shelter and create their own little community, complete with self-governance. 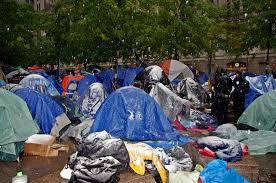 No, that’s not the architectural drawing, that’s Occupy Wall Street — an eco-village of tents in a public park complete with self-governance, lots of crime, and in general a blight on the environment. The architectural drawings for the Boulder design are here, and look like a standard campground. Except for the teepees, which we expect could be kept warm by cutting down park trees to be used for kindling. “This eco-village will be Boulder’s first intentional community for Boulder’s affordable housing population that includes residents who are homeless,” Morey Bean wrote in a pre-application review request submitted to the city’s Planning and Development Services department. Yes, an “international community,” because those homeless folks are such jet-setters.